The Presidency has said it is not aware of any probe on the tenures of the Emir of Kano, Muhammadu Sanusi and that of Prof. Charles Soludo as governors of the Central Bank of Nigeria. In reaction to social media reports that the Federal Government had concluded arrangements to probe the tenures of the two former CBN governors over their views on the state of the nation's economy, Malam Garba Shehu, the Senior Special Assistant on Media and Publicity to President Muhammadu Buhari, said the presidency was unaware of such probe. According to the reports, Sanusi and Soludo had been put on “the watch list of the government for some alleged anomalies that occurred during their tenures as head of the Nigeria's apex bank''. 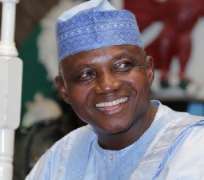 Shehu in a tweeted message, said the presidency was not aware that the Emir and Soludo would be probed for offering suggestions to the president. “Where did that report come from? Under our constitution which President Muhammadu Buhari swore to uphold, it is not a crime to offer suggestions,'' he said.